The Orient opens its heart to radio and in the footsteps of the American listening public, succumbs to the appeal of native amateur hour artists. AGE-OLD China, shaking loose from centuries of tradition, has taken the radio to its heart, and loud speaker entertainment has become one of the most important influences in a nation which is fast adopting the modernism of the west in even the most outlying sections. From bustling Shanghai and fast-growing Nanking near the eastern coast, to Chengtu in remote Szechuan province, from the far reaches of Hopei province in the north to Yunnan in the extreme southwest, countless receivers blare forth a cacophony of western and Chinese music, announcements, speeches. Out of the ether to hundreds of middle schools come the lessons and exhortations of mass-education broadcasts. In shops and homes are heard, in rapid succession, the traditional story-tellers of old Cathay and the swing music of American jazz bands from the swank hotels and cabarets of Shanghai. And once a month, to crowds reminiscent of World Series listeners in America come the stentorian voices of announcers reciting the lucky numbers of the National Lottery. In Shanghai, largest city in China and generally deemed the most cosmopolitan community in the world, one can and does hear radio voices in English, French, Russian, German and Japanese as well as the customary Chinese with its numerous dialects and shadings of accent. That China should become radio-minded to the extent recorded in the past few years may fail to impress Americans or Europeans as remarkable, but when it is remembered that in this country of 450,000,000 people only a pitifully small percentage are able to afford their own receiving sets, the interest shown to date is nothing less than phenomenal. In a nation where human labor is cheaper than that of animals, where thousands of men pull other men in rickshas, where a monthly salary of $30 American currency is considered high, and where millions of people pay less than 6 cents for a restaurant meal, the extent to which radio has conditioned the lives of the masses is more than impressive and the growth of the radio-entertainment business a modern miracle. The most recent statistics show that China imports radio material and sets to the amount of about $800,000 a year, with the United States supplying the lion’s share of the total. The nation’s largest and most powerful transmitter, XGOA, owned and operated by the Chinese Government at Nanking, boasts the most modern equipment and facilities, and a power of 75,000 watts, putting it in the ranks of the world’s most powerful stations. But in the majority of stations equipment is crude and inefficient, broadcasting technique is in its infancy, and program arrangements and talent have nowhere reached the fine point which they have, for example, in the United States. But refinement of equipment and power output of the transmitters are no indication of the stations’ popularity. Scores of little stations, with power ranging from 100 to 500 watts, regularly broadcast programs which boast a popularity easily comparable with that of the top-notch network performances in America. Until now radio stations have experienced a high mortality and turn-over in China. For a time anarchy ruled the ether, and stations took to the air at their owners’ whim, grabbing any frequency and call letters that suited their fancy, and shifting from one to another regardless of international usage and half- hearted attempts at regulation. Now, however, China is a member of the International Radio Convention and in the interests of harmony all nationals, including those not subject to Chinese laws, abide by the regulations and control of the Ministry of Communications. The prefix “X” is now used by all broadcast stations and allotted wave lengths are adhered to by all. Under the strict regime of the Ministry the channels have been cleared and the number of outlaw stations is infinitesimal. Today the industry is more stable than at any time in its history. Radio broacasting was introduced into China in 1922 through the enterprise of an American firm which established a 50-watt station. Soon after its beginning, however, it was closed down, presumably because the expected financial returns did not materialize. 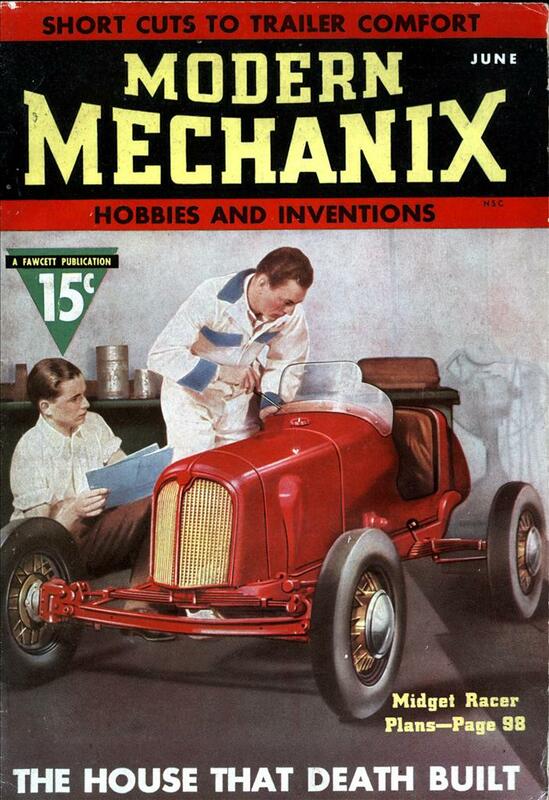 A second attempt was made about a year later, also by an American firm, which was engaged in selling receiving sets and accessories and went on the air with a view to stimulating its own sales. In those days, with short-wave transmission and reception confined to commercial enterprises and “hams,” the hearing of entertainment programs from overseas was undreamed of, and in order to sell radio receiving sets, one necessarily had to provide something to receive. The effort lasted exactly six months before it collapsed. In the meantime, however, the germ of radio had affected a number of young Chinese, who entered the field from the amateur ranks, and who availed themselves of every opportunity to learn more about the fascinating subject from the Americans who seemed to know more about it than any other foreigners in China. Some of the young Chinese enthusiasts went to the United States to gain first-hand knowledge from American radio engineers. In 1924 the Kellogg company, American manufacturers of telephone and radio equipment, opened a branch office in Shanghai for the sale of its products, and at the same time inaugurated a 100-watt broadcasting station. Its equipment was subsequently sold to a series of other owners, who were on the air with a variety of stations until the equipment became obsolete and was replaced. The year 1927 marked the first advent of the Chinese themselves into the business, as the owners of a large department store in Shanghai, sensing the advertising possibilities of radio, installed a 50-watt station. The program consisted of market reports, news summaries and Chinese music. At the same time radio first took hold in other sections of China and the Ministry of Communications set up a long-wave transmitter for the Tientsin Radiogram Bureau. In Peiping, then Peking and the capital of the nation, the telephone bureau opened a 20-watt station and subsequently increased its power to 300 watts. By 1928 the Chinese Government definitely entered the radio business and erected a station in Chekiang to transmit government orders and important news to the various parts of the province. Starting with an output of 250 watts, the power was later increased to 2,000 watts. The same year the Central Broadcasting Station was built in Nanking, which had become the national capital as a result of the Kuomintang revolution. This station started out with 500 watts but its power was brought to its present proportions after a complete rebuilding of the station and the importation of much of its equipment from the United States. At present there are 89 broadcasting stations in China, of which 39 are located in Shanghai. The remainder are located at strategic points throughout the country so that, although the majority are of low power, a system of re-broadcast is possible and approximates a national hook-up whenever required by the government for important announcements or programs. The stations located in such political centers as Nanking, Kunming (Yunnanfu), Hankow, Hangchow, Chungking, Nanning, Canton, Foochow, Nanchang, Tsinan, Peiping, Chinkiang and Taiyuan are either under government control or are operated by the local provincial governments and are used chiefly for the broadcasting of official orders and instructions. In Ningpo, Tientsin, Tsingtao, Wusih, Chiahsing, Soochow, Wuhu and Shanghai, however, all important commercial centers as well as seats of local governments, the stations are largely privately owned and are used to serve business interests. Here energetic salesmen solicit sponsors, for programs, announcers declaim the merits of toothpaste and cigarettes, and one hears talk of “sustaining” and “commercial” time schedules. Shanghai is the country’s leading radio center, and the source of most of the purely entertainment programs. Of its 39 studios, all except four are under private ownership and have as their principal objective the dissemination of advertising and entertainment. The programs, in general, follow the technique of the west, but invariably retain a distinct and characteristic Oriental twist, aside from the almost universal use of the Chinese language by the Chinese-owned stations. For example, in spite of the whole-hearted acceptance by the Chinese people of the modern facilities and equipment which bring them their radio programs, they extend their greatest favor to the most ancient type of program, the Chinese story-teller. This is a type of entertainment which has come down through the ages and thrived in a nation where less than ten per cent of the population is literate The story-teller puts on a one-man show, accompanying himself on a stringed instrument resembling a guitar. His subject matter consists of the age-old tales and legends of the people. Some of the stories are accounts of the exploits of emperors; others have to do with the life of the masses, while still others are simple fairy-tales. But the telling of the tales is more than a reading; the performance takes on the characteristics of high drama, and the episodes are both moving and exciting. Radio plays are also popular with a race which probably more than any other delights in going to the theater. In western countries the legitimate stage may languish as a result of competition from the moving pictures, but in China the screen dramas in a strange language have to struggle for popularity against stage plays in the Chinese language. The radio, however, is peculiarly fitted to supplement stage performances, and brings the pleasure of theatricals to families which can seldom afford to visit the theater. And since the Chinese stage pays little attention to scenery, concentrating on action and characterization, the native drama suffers little by transfer to the ether, and is one of the greatest attractions to the Chinese dial-twisters. News broadcasts also find a large and enthusiastic audience. Enterprising Shanghai newspapers have agreements with various radio stations to broadcast the news at regular intervals during the day, and the Chinese public, as news-hungry as any in the world, often turns to the radio receiving set as its sole source of information. Other programs provided by the stations include modern Chinese music and Chinese jazz. The long-drawn wail of Chinese lady singers, particularly those affecting the Soochow accent, affect Chinese swains in the same manner that American crooners are supposed to affect feminine hearts. A Soochow accent might be compared to the southern accent in America, and is sedulously cultivated by the lady crooners as an item of charm. But radio stars as such have not developed in China, and there are virtually few outstanding performers whose names and talents are nationally famous. There are two reasons for this; one is that fans tune their sets to certain stations for certain types of programs, and personalities of the performers mean little; the second is that a large portion of the radio talent is drawn from the amateur ranks, with consequent large turnover. The young men and women who take part in radio plays or who sing before a microphone at night, quite often work in stores and offices during the day-time and so are unable to devote to radio the time and effort which bring eminence and publicity to the professionals. 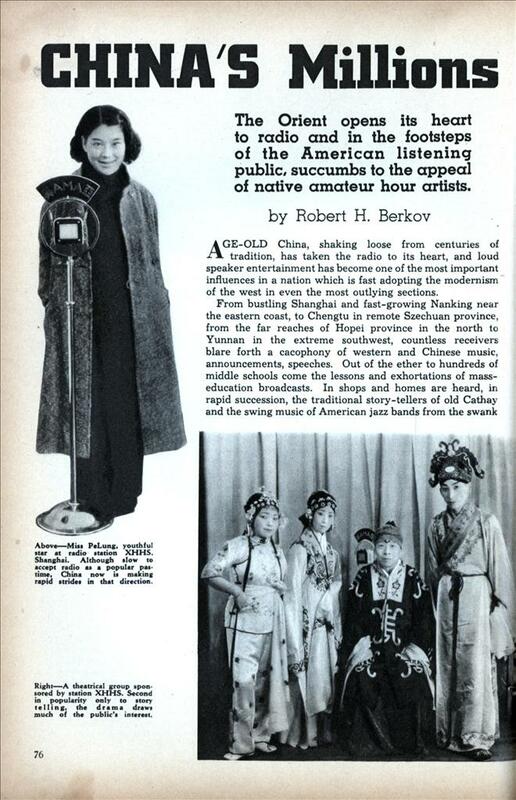 Use of amateur talent, on the other hand, can be tremendously popular, as radio listeners in America know, and the extent of the amateur field in China would probably warm the heart of Major Bowes. A few of the amateurs have graduated into the professional ranks, but a majority continue their regular daily work in other lines of endeavor. Some of the most outstanding amateur programs broadcast in China today emanate from the studio of Station XHHS, representing the Radio Amateurs’ Home, a unique institution devoted to the non-professional in every aspect of radio. This organization has performed a notable public service during the years by bringing advanced radio knowledge to amateurs in China. Not only does it sell equipment for amateur receivers and transmitters, but it engages in extensive educational work to spread public knowledge of radio. Aspiring “hams” are taught how to assemble sets and are given advice and help in ironing out all their problems. A magazine “China Radio,” is published in the interest of amateur activities, to keep radio enthusiasts in this country fully apprised of developments in China and abroad. The station XHHS, featuring youthful entertainers, among whom the Wong sisters enjoy a high degree of popularity, draws a large home audience. In the evening, after an early dinner, the largest number of Chinese settle themselves for an evening at the radio dials, and thousands tune in to XHHS. XQHC with a power of 1,000 watts is also located in Shanghai. It is operated by the Ministry of Communications, but offers programs of pure entertainment, and is not concerned with official business. Its equipment is probably the most modern in Shanghai, but its popularity with the masses is only moderate. Programs are broadcast in English as well as in Chinese, and include news summaries as well as musical numbers. It features programs presented by students of the various middle schools. The Municipal Government of Greater Shanghai (Chinese areas) also operates a station, XGOI, from the Civic Center located in the territory bombed by the Japanese in 1932 but now rapidly becoming one of the show-places of Shanghai with its resplendent buildings housing the local Chinese government organs. XGOI has a spasmodic schedule, however and is heard only when unusual events are being staged at the Civic Center. Principal sports competitions, in the Civic Center stadium are broadcast on a play-by-play basis from XGOI which becomes one of the most popular stations in the country for the duration of the event. Although its power is only 500 watts it is consistently heard in even the most remote sections of the country. XMHA is the best-known foreign station, and broadcasts all programs in English. It is American owned and is run similarly to a station in the United States. Another American station was recently sold to Japanese interests, and now broadcasts programs in English, Chinese and Japanese. On the days of the National State Lottery, the microphones of four local stations are installed at the Canidrome where the drawings take place, and as each number is drawn from the drums, the digits are announced simultaneously in Chinese, English, French and Russian. Contrasting sharply with American practice, two religious stations are among the most active in Shanghai, and their programs are usually well received. One is the Shanghai Christian Broadcasting Station operated by Mrs. H. C. Robertson, an American woman. Its programs are almost exclusively religious, but music is interlarded with sermons. Because of the large number of missionary stations in all parts of the nation, some in the most outlying areas, and because of the comparatively large body of Chinese Christians, the programs of this station enjoy a larger audience than might be supposed. In addition the news broadcasts of this station, presented in English, are eagerly awaited by foreigners in isolated stations. The other religious station is of a different nature. It is the Fo Yin station, and is operated by the Shanghai Buddhist Assocation. The organ of a section of Buddhists which believes in discarding the old tradition of tranquility and making an aggressive campaign for religion, this station reflects an evangelistic fervor comparable to that of many American Christian institutions. Music, impassioned orations, lessons and plays with a religious motive can be heard at almost all hours of the day or night, and the station is among the best known in China. Mass education activities in Hopei province also make wide use of the radio. Conforming to orders of the Ministry of Education, radio sets have been installed in all middle schools of Hopei province, and programs of the mass-education movement are sent out from several government-owned stations simultaneously. In its campaign to educate adults as well as children and to make the masses literate, the Ministry of Education plans an increasing use of the ether waves. Recently the Chinese Government ordered all stations in China to pick up a broadcast from XGOA at Nanking between 8 and 8:30 o’clock every night and to re-broadcast it. The program, it was announced, would consist of good music, talks, and news announcements in both English and Chinese. A howl immediately arose from operators of stations in Shanghai, particularly the foreign-owned stations, who resent the surrender of one of their best broadcasting periods to the Government. Although the Chinese stations objected also, they quickly complied with the Government order, but the foreign stations showed a disposition to resist. Finally, however, all except two, an American and a French station, decided to comply. The Government is still attempting to reach an amicable agreement with the two defiant stations which will result in their following the example of their colleagues. This was a great article on not only the development of radio in China but the cultural implications of the introduction of a mass media engine on a populace who looked at it as the apex of communication technology. This was similar to what the United states had experienced a few decades earlier. One year after this article, the Japanese invaded mainland China and quickly captured Beijing and Tianjin which sparked 8 years of bloody conflict. In 1946, there occurred the Revolution in China that resulted in the current Communist regime. All forms of communication soon became controlled by invaders or the national government as it did in many other governments of that era. We in the U.S never experienced this which is why we advanced to the Tyra Banks Show, Rush Limbaugh and Facebook. Yep, communication technology certainly reflects the parent culture.